The truth is, unless we live alone, and maybe even when we do, our lives are easily filled with clothing, and paper, and dishes, and stuff, and more stuff. No one is immune to clutter. Even those of us who clear clutter for a living. But when I get home at the same time as my kids, and I need to make dinner, and do homework, and help with baths, and, and, and…there is simply no time for that pile or that closet. Instead of beating myself about the things I’ve let slide for a while, I’ve chosen to laugh at the irony of being an organizer whose house is not always organized. And then, I’ll shrug it off and do better tomorrow. I invite you to laugh at with me too. 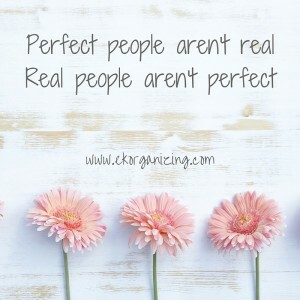 I choose real over perfect, any day. So tell me, what makes you real?